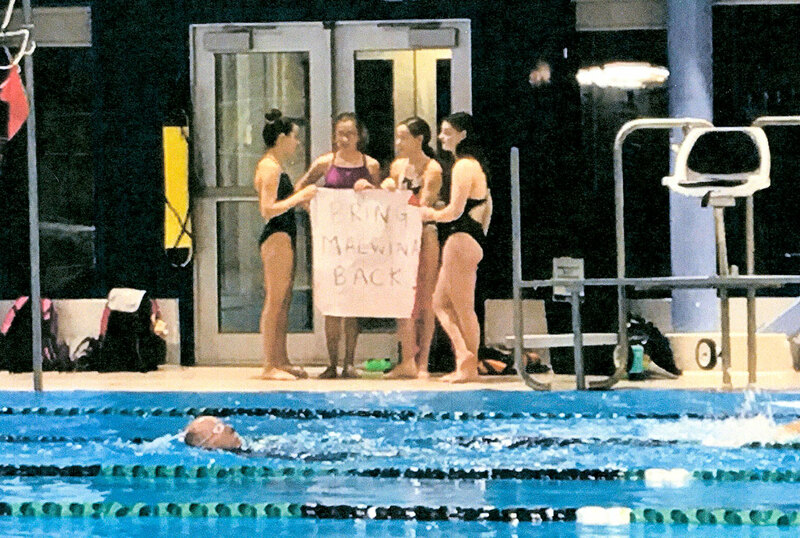 SWIMMERS PROTEST – Whitehorse Glacier Bears swimmers hold a sign that says “Bring Malwina Back” at the Canada Games Centre on Thursday. The swimmers wanted the WGB board to know the impact Malwina Bukszowana has had as their swimming coach. Whitehorse Glacier Bears swimmers, instead of practicing, used the time to protest the resignation of their coach Malwina Bukszowana Thursday morning. Members of the team will once again protest their coaches resignation today at 3:30 p.m. at the CGC. The swimmers wrote a letter to the board members of the WGB asking them to please bring back Malwina as their coach. The letter was signed by 18 of the swimmers to bring back their coach. The letter continues to ask the board to consider stepping back and allowing Bukszowana to at least finish the season as everyone involved needs consistency and a path forward to continue training. A third letter by “concerned parents” said the board is not following the WGB Code of Conduct and Conflict Resolution Policy. More to come after tonight’s protest at the CGC.